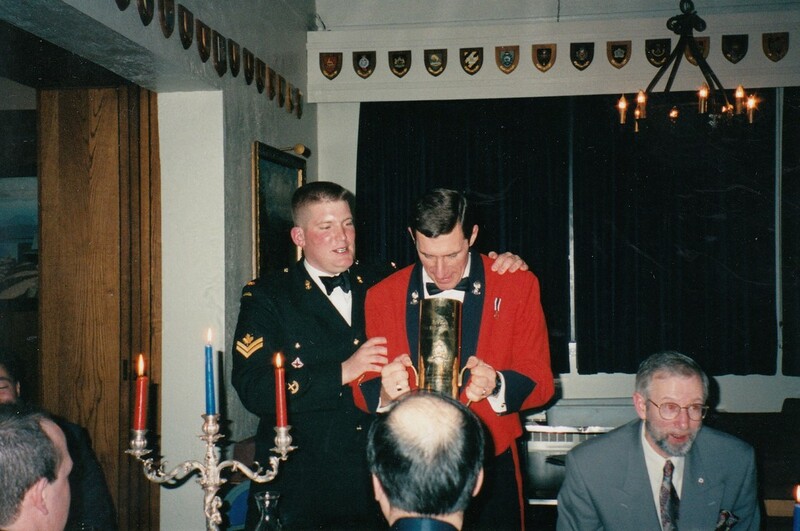 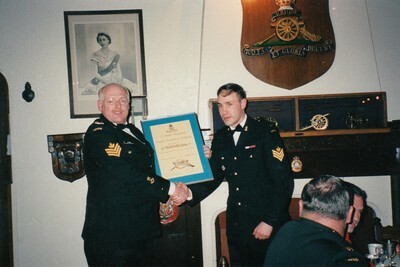 Presentations take place immediately after the toasts with the Regimental Sergeant Major, Master Warrant Officer James Jacobson presents the Best Bombardier of the year trophy to Master Bombardier Matt Gillies. 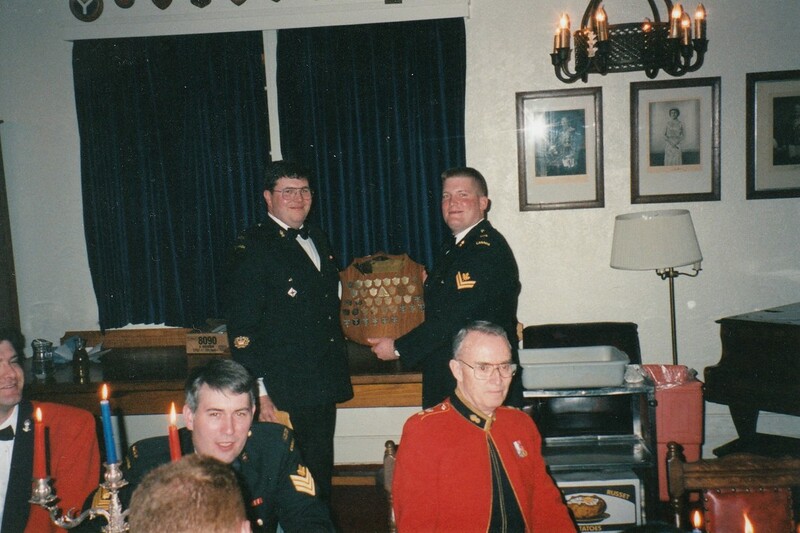 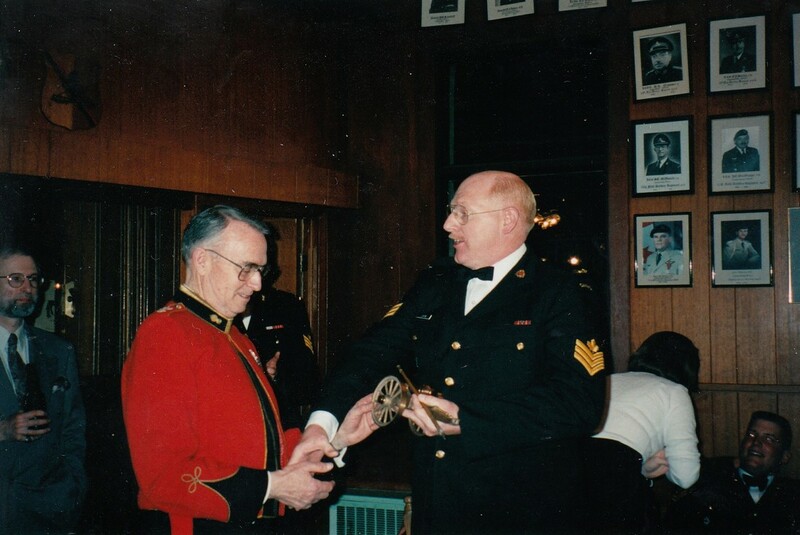 Sergeant Donato Calogero presents a departure gift to Sergeant Keith Laing on his transfer to 12 Service Battalion. 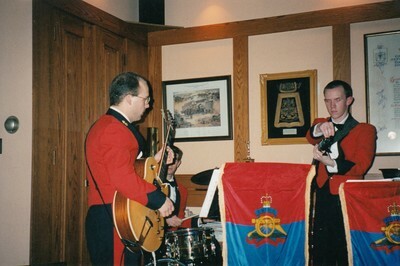 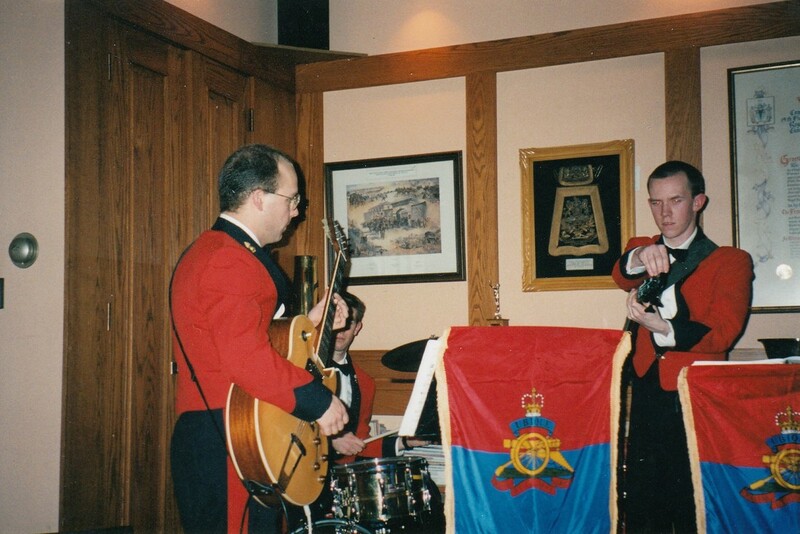 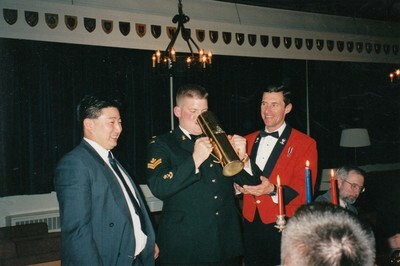 The Regimental Band supports the Mess Dinner as the Mobcom Cup starts. Filled with a concoction by the Battery Sergeant Major of the Firing Battery, the gong is passed from person to person around the table until emptied. The safety rule is that the person on the left and right of the drinker must also stand in case the drinker feels faint from imbibing the toxic substance. The RSM begins the Mobcom Cup with Major Al Woo and Major Vic Stevenson prepared to support. Major Leon Jensen recounts some tale of either having filled the Cup as BSM or having started the Cup on its path as the RSM. 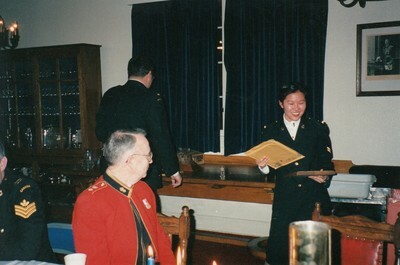 Warrant Officer Benson Lum stands prepared to assist. There's other familiar faces (or faces hidden by the Cup?) 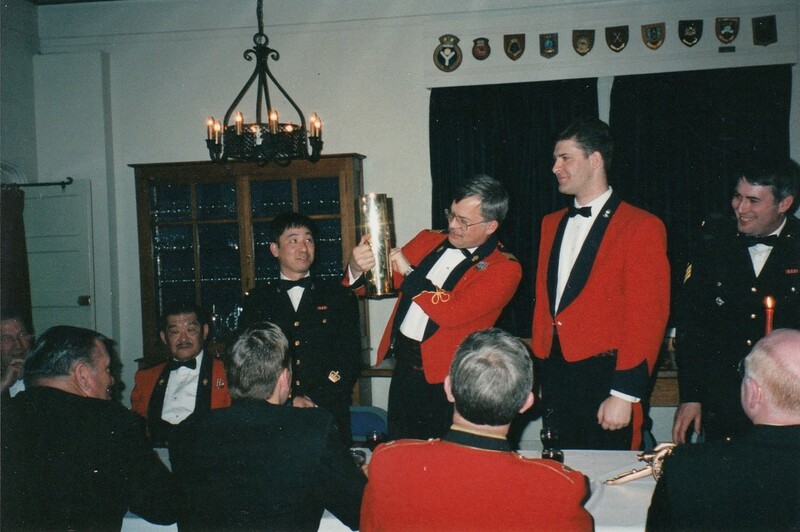 The Brigade Sergeant Major Chief Warrant Officer Ron Cullen., Major Peter Erwin, Sergeant Ian Smith, Warrant Officer (ret) Mike Meehan, Sergeant (ret) Mike Imada, Captain Archie Pell and Lieutenant-Colonel Barrie Hamilton. 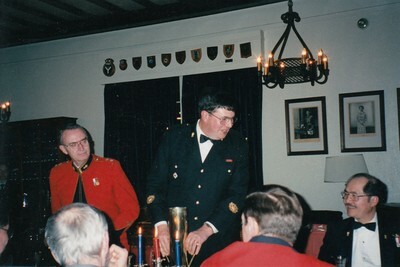 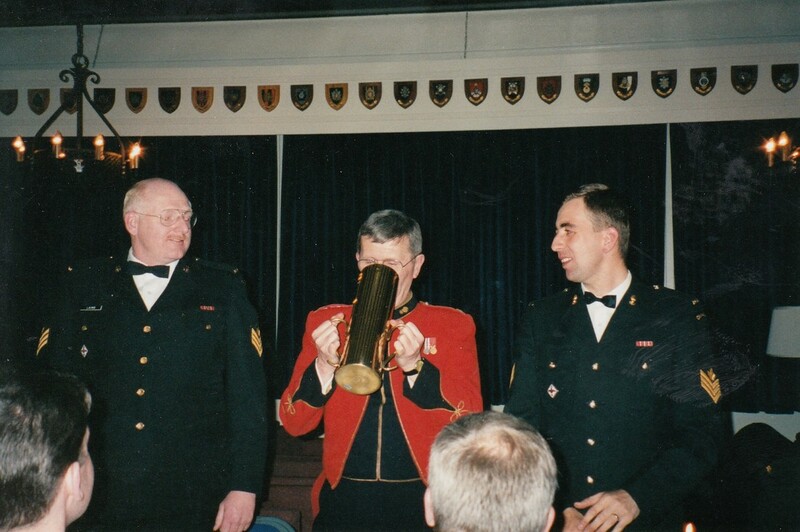 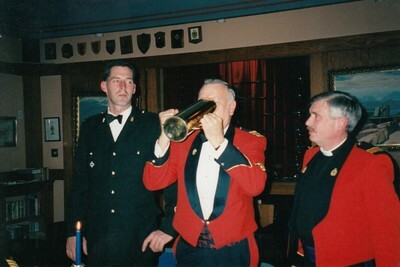 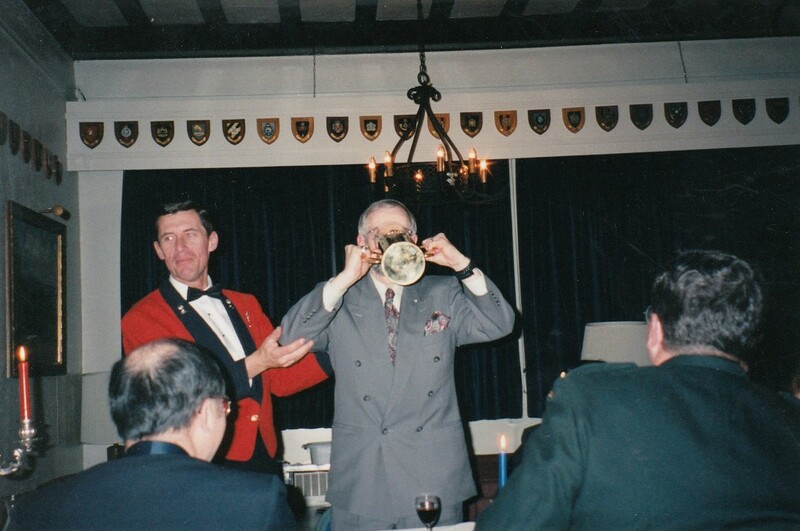 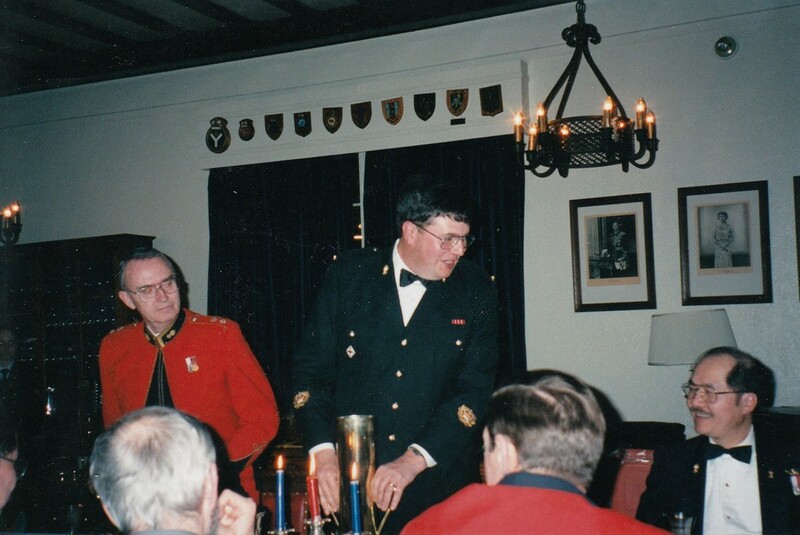 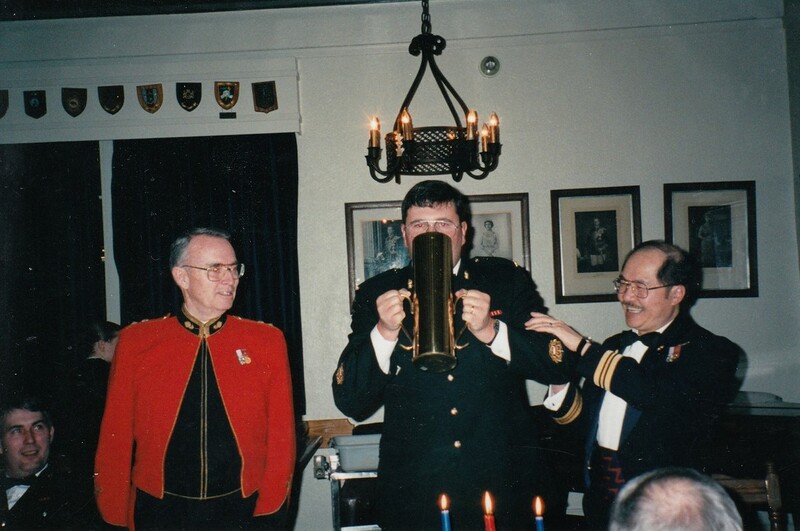 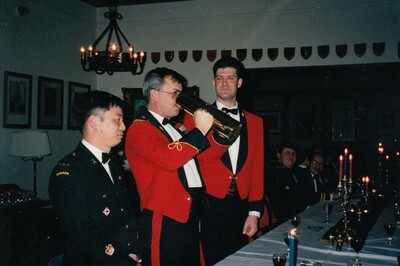 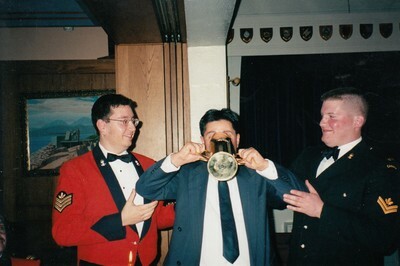 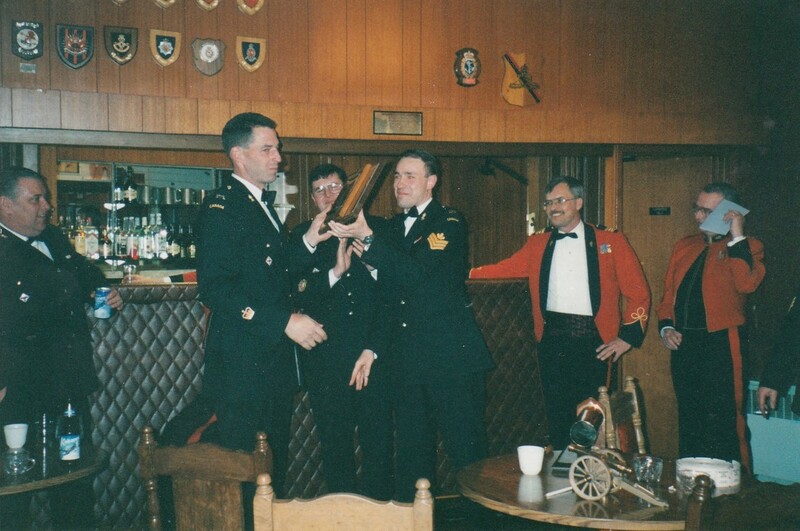 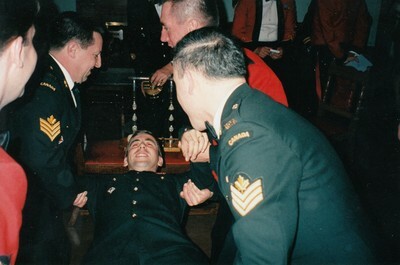 ​After dinner, Sergeant Keith Laing wrestles Major Vic Stevenson over one of the miniature cannons? Warrant Officer (ret) Mike Meehan watches from the Bar. 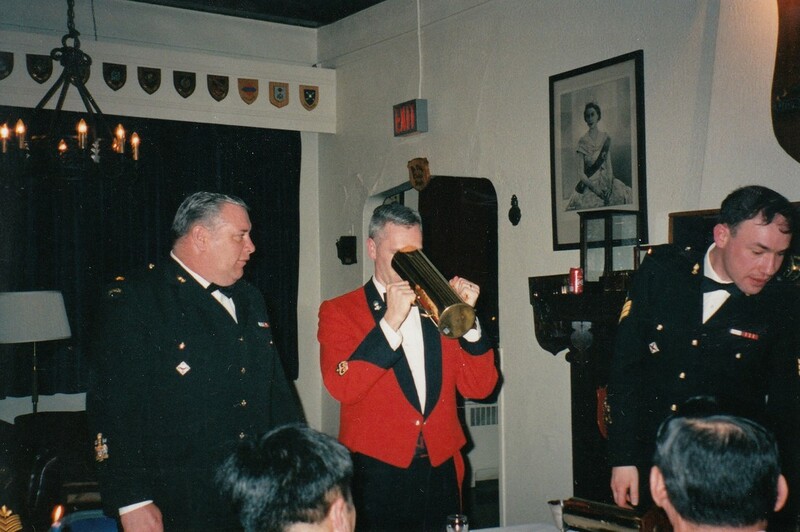 ​Sergeant Brian Holt, Sergeant Rob Wishnicki and Sergeant Donato Calogero gong a new promotion. 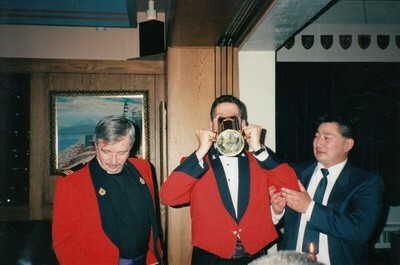 The last photo may be the induction of a new member into the order of Dirty Old Men (DOM)....but I need confirmation of one of its members!